Dy-On-Crete® Mark 2 is a high technical quality, water-based, single pack pigmented liquid surface coating. It has been specifically developed to provide a long-lasting and extremely durable, natural-looking colour coating / stain for concrete, mortar, masonry and primed new or weathered timber. 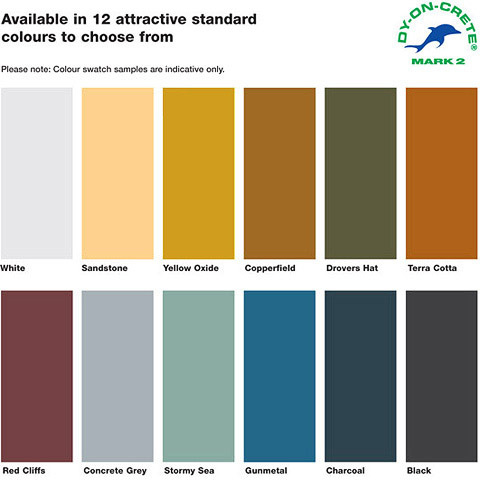 Supplied as a ready-to-apply liquid, Dy-On-Crete® Mark 2 is available in a choice of 12 opaque ‘natural earth’ colours. It is ideal for artificial rock making and/or natural geological colour ‘blending’ or concealment /camouflage of concrete and shotcrete. Dy-On-Crete® Mark 2 is suitable for both indoor and outdoor applications, and thanks to the incorporation of a robust rubber/acrylic polymer binder system and the use of Ability Building Chemicals’ colourfast abilox® mineral oxide pigments, is both highly UV and weather resistant - providing maximum longevity - proven over 22 years in the building and construction industries. Easy and safe to use, Dy-On-Crete® Mark 2 is a non-toxic, low-odour, totally non-combustible water-based liquid which is safe to use indoors and safe to store. The product is odourless when hardened. Dy-On-Crete® Mark 2 is suitable for use on both vertical and horizontal internal and external surfaces including roofs, suspended slabs and walls. The product is also ideal for use on architectural features including artificial rocks and embankments, and can be used to colour blend concrete and shotcrete with the surrounding natural geological environment. • Partially weathered, unpainted hardwood timber in sound, firm condition and free from mould/fungi or wood that has been prime (first) coated with a quality wood primer. • Can be quickly colour matched to almost any colour on firm advance order to suit specific project requirements and to rectify off-colour precast concrete panels. Supplied as ready-to-use, single-pack liquid, Dy-On-Crete® Mark 2 can be applied using either an air assisted or airless paint spraying unit. However, in instances where a more penetrative finish is required on porous or semi-porous surfaces, it may be brushed, broomed, mopped or rollerapplied. For long term durability, Dy-On-Crete® Mark 2 should be applied at a coverage rate of no more than 8-9m2/litre to the prepared surface, which should be suitably prepared to ensure that it is non-dusting, firm, sound and clean. Ensure that when applied to wood that the wood has been suitably primed with a good quality wood primer. The product applied with a minimum of two coats may also be used, without a primer, on weathered wood that has not been painted and is firm, sound and free from mould / fungi. Dy-On-Crete® Mark 2 requires a minimum of two coats or layers, however, three coats are generally recommended for maximum longevity - around 20 years. The applied product becomes 'touch-dry' within 30 minutes in an air temperature of 23ºC with a Relative Humidity (RH) of 50%. For optimum results, subsequent coats should preferably be applied at normal temperatures within 1 - 2 hours of the previous coat. Dy-On-Crete® Mark 2 comes in a range of 12 factory mixed colours. Dy-On-Crete® Mark 2 is supplied as a ready-to-use, single pack liquid. Dy-On-Crete® Mark 2 is suitable for use on a wide range of clean, dust-free and stable vertical and horizontal substrates, including: concrete/shotcrete, external wall rendering and other mortar, masonry, internal wall plaster, fibre cement panels and sheets, new wood coated with a good quality primer and unpainted weathered wood that is firm, sound and free from cracking/checking and mould/fungi. 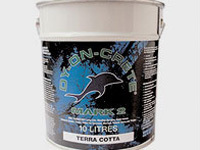 Dy-On-Crete® Mark 2 is supplied in 10 litre pails. Recommended coverage rate is no more than 8-9m2/litre per coat, with a minimum of two coats required for all applications. Three coats are recommended for maximum weathering resistance and longevity to last around 20 years before recoating is necessary, as well as for trafficked interior floors and exterior pavements subject to wearing /abrasive forces. For maximum shelf-life, Dy-On-Crete® Mark 2 should be stored in its original container, out of direct sunlight, in appropriate, dry, not excessively high temperature conditions.When stored in appropriate conditions in its original unopened container, Dy-On-Crete® Mark 2 has a storage shelf life in excess of 12 months. For further Health and Safety information, please refer to Dy-On-Crete® Mark 2 Safety Data Sheet (SDS) which is downlodable from our website or contact Ability if you require more information.